SixB Labels has more than thirty years of experience producing high quality, custom stickers and labels. Our custom bumper stickers come in a variety of styles to perfectly fit your needs. Request a free catalog, and we will customize it according to your specification. We'll include bumper sticker samples, so you can see the print quality even before you order. Standard sizes to choose from: 4" x 6", 3.75" x 7.5", 3" x 11.5", 3.75" x 15". 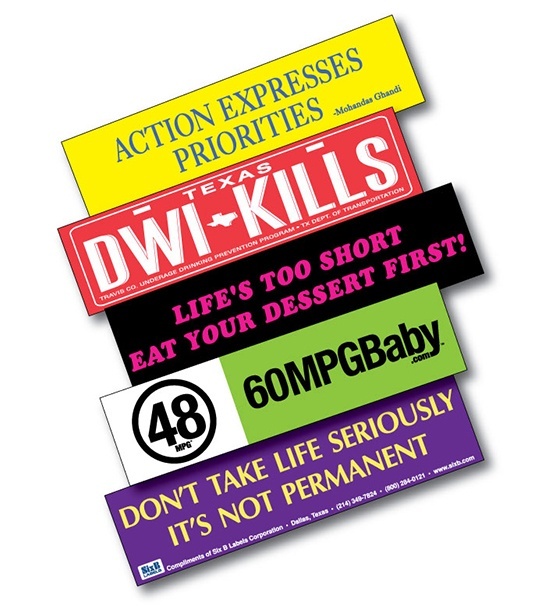 Bumper stickers for all occasions (both outdoor and indoor use). Great for promotions, branding, and building awareness for causes and organizations. Silkscreen printed on vinyl with U.V. inks to minimize fading due to sunlight. Note: red, orange and yellow fluorescent inks will fade in a few months with exposure to direct sunlight. From 1 to 8 spot color bumper stickers including 4 Color Process sheeted format. Removable adhesive bumper stickers to avoid damage to car bumpers or other surfaces. Minimum quantity of 125 to several million labels. Check Out Our Eat Dessert First blog page!